We have written an earlier printmaking 101 post about lithography, which you may have read. However, if a picture is worth a thousand words, this video, put together by MoMA in conjunction with the Robert Blackburn Printmaking Workshop is worth 10,000! 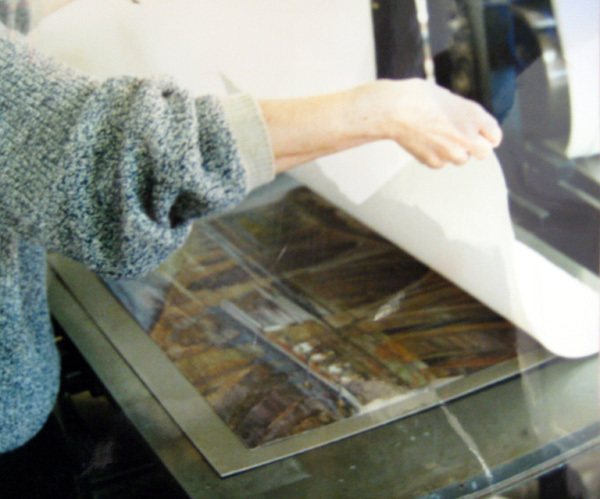 If you’re still having trouble visualizing how a lithograph is made, check it out! Wow! We are so impressed with the quality of the work that is coming in for Excellence in Printmaking–it just gets better every year! When expanding the original award into a full-blown exhibition, professionalism was one of our biggest concerns. Would these students know how to frame a work properly? Would they be able to ship it well, if need be? Turns out, they do! But it has gotten us to thinking, what are some main points we at WPG would share to emerging artists trying to look professional? Read on to find out! 1. Follow instructions-If we could only give you one piece of advice, it would be this. When applying to a gallery, a show, a residency, or anything else, make sure you read the prospectus thoroughly and completely before starting anything. Yes, sometimes it’s annoying to have to resize all your images, but we promise, nitty gritty details like that aren’t arbitrary (or else they wouldn’t be there). Expanding on the above example, images won’t show up well in our jurying system if they are too small or too big, and might be arbitrarily re-sized. If you don’t follow directions, you (at best) annoy the person who is in charge of giving you that show/grant/residency or (at worst) have your entry thrown out entirely. 2. Paperwork is your best friend-A very boring friend, maybe, but definitely reliable. If nothing else, keep an inventory and a calendar. The inventory can be a simple spreadsheet by title where you can check whether a piece of work is in, out, or promised to be somewhere. The calendar also helps in your planning. If you know you’re applying for a show when your work is due May 1, you know not to submit anything that’s going to be in another show April 15-May 15. You can also see when you’re free for artist talks, gallery visits, and more. 3. Multiple résumés are good-If you take a day to make a few résumés you’ll thank yourself later. Every artist should have at least three: A long artist résumé, a short artist résumé, and a professional résumé. The long artist résumé is where you list everything you’ve ever done. It can be as many pages long as you want it to be. The short artist résumé is a one-page document that highlights some of your biggest accomplishments in the art world. The professional resume may or may not have some of the same information on it, depending upon what field you work in. If you’re in the arts field, the short artist résumé and the professional one may be identical. However, if you aren’t, perhaps your prospective employer doesn’t need to know about every art show you’ve been in the past two years, and conversely the gallery you’re applying to may not need to know every place you’ve worked since high school. 4. Keep going! It’s always tough to get a rejection letter, but you’re going to get a lot of them. Do NOT take it personally and do NOT give up. You’ll find that fit that’s right for you, but only if you keep looking. The more you put yourself out there, the more good things that are going to come your way! Want more advice? Check out our earlier posts on applying for shows, presenting your prints, and planning a stress-free solo show. You can read more about Lithography and other WPG news in this month’s newsletter, also the source of last week’s Printmaking 101: Paper Lithography post. Lithography could be considered one of the most autographic fine art printmaking techniques: an artist can draw on a lithographic stone or plate with crayons or brush in much the same manner as drawing on paper, a characteristic that is appealing to many artists. In traditional lithography, the artist uses slabs of Bavarian limestone or manufactured, grained aluminum plates which are printed on specialized litho presses. Whether working on stone or grained metal plate, the artist or master printer must also understand the etching chemistry required to fix drawing to printing surface. Alternatively, some contemporary artists use polyester litho plates which have a hydrophilic quality or even xeroxed images on paper to print in a lithographic manner. 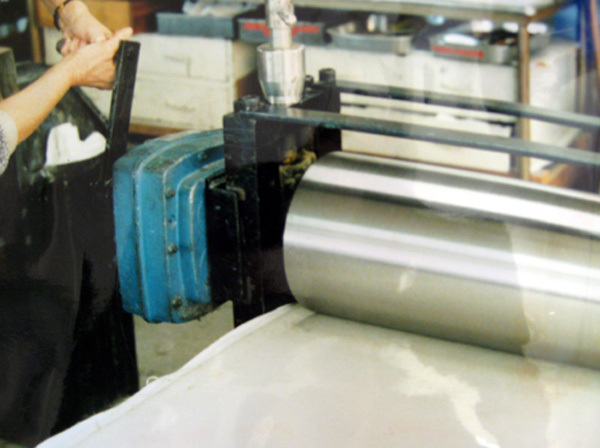 Both traditional and alternative approaches rely on creating a printing surface where ink, when rolled across, is attracted to the greasy drawn areas and is repelled by dampened non-drawn areas, thereby exploiting the antipathy of grease and water characteristic of the lithographic process. Lithography is considered a planographic approach, meaning images are printed from an overall flat surface, different from other techniques such as: relief prints where ink is transferred from the top surface of a gouged block (as in woodcuts and linocuts) or from raised surfaces of collaged plates; or intaglio prints where ink is transferred from incised or etched lines/ textures lying below the plate’s surface; or stencil approaches such as silkscreen prints where ink is pushed through open areas and where blocked areas remain unprinted. 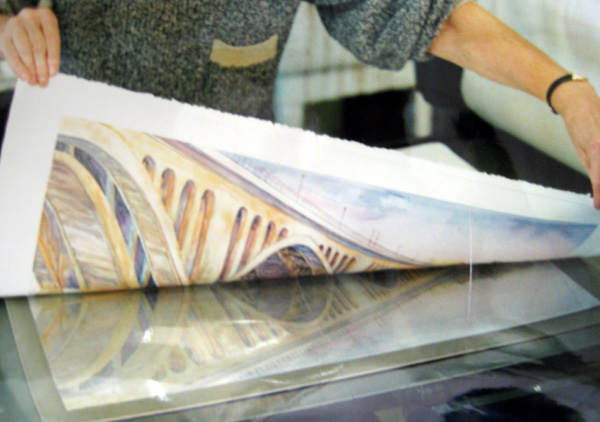 Like other printmaking techniques, lithographs can be printed in black and white or color, in layers of imagery, in combinations with other media or other printmaking techniques, extending an artist’s vision multiple ways. An excellent Baltimore Museum of Art video of Brian Garner of Baltimore’s Litho Shop explaining how a lithograph is made. The following introduction to paper lithography is taken from an article written by Martha Oatway, in our Winter 2012-13 Newsletter just published today! You can read more about lithography and all other happenings at WPG in the newsletter, at the link above. Paper lithography is the process of inking a toner based photo copy (the plate) and printing it onto printmaking paper. I first learned of this process when I took a workshop at the Center for Contemporary Printmaking in Norwalk, Connecticut in the late 1990s. The workshop instructor told us the method was invented for woodcut and linoleum printmakers to transfer their images onto wood and linoleum blocks. At some point a printmaker discovered it to be a method in its own right. The method is simple but technique driven. A high contrast drawing or photograph is photocopied onto paper. Alternatively, a hand drawing in grease pencil or oil pastel can be used. The toner, grease pencil or oil pastel is the vehicle for the ink. the gum mixture. The plate is inked with a brayer and wiped with gum mixture repeatedly until the grease or toner image is completely covered. This part is tricky as darker inks can’t be seen as well on the toner. Over working the plate is very easy as the paper fibers wear down and the toner can rip up if the ink is not modified correctly. The fully inked plate is placed on the print paper and run through the press. The plate is thrown away. Images can be enlarged or reduced according to the need of the printmaker. There are many advantages to using paper lithography. 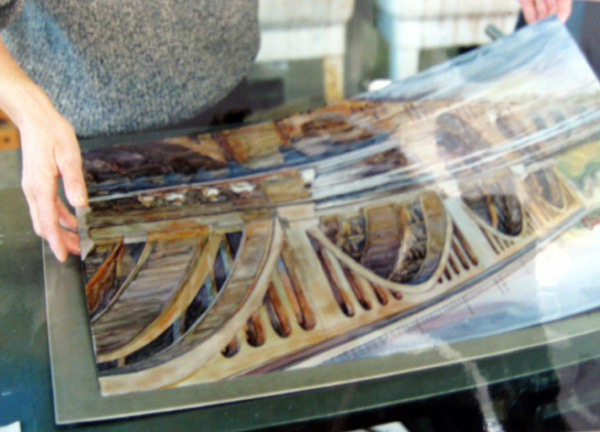 It can be used as a one-off, in multiple layers to build up imagery or to add an element to another printing technique such as etching, collagraph or drypoint. 1. 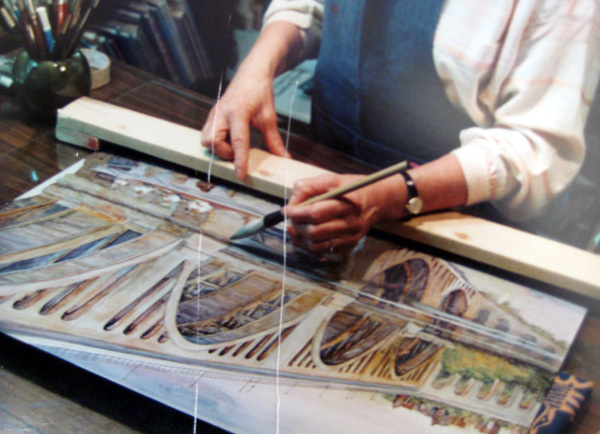 First, the artist (Yolanda is shown here and below) paints onto an aluminum lithograph plate. To the left, you can see Yolanda preparing a plate, to the right is a fully prepared plate. The plate is then left to dry. 2. The dry plate is positioned on the press bed. 3. Dampened paper is laid over the print (on the left) and the entire thing is run through the press (on the left). 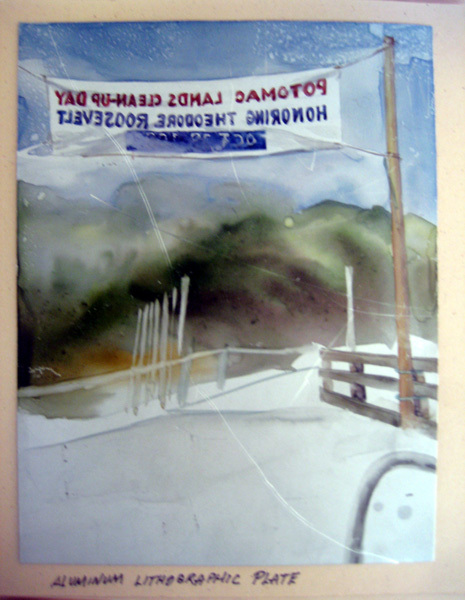 The damp paper re-activates (re-wets) the watercolors on the aluminum plate, allowing for the transfer to happen. 4. We have a print! As the name implies, this usually only yields one print per plate. Occasionally, however, there may be enough pigment left on the plate for a strong second image or a weaker ghost image. Your first question may be “why the extra step? Why not just make a watercolor?” Yolanda answers, saying “effects are achieved with monotype are not possible in other forms of art [such as watercolor].” In Yolanda’s watercolor monotypes in particular, one can see a certain uniformity of mark-making and color: this is in part from the artist herself but also from a flattening, if you will, of how the paper uniformly picks up color off the plate. Also, we like the tell-tale print edge, where the plate indented the paper, that is present on these monotypes.